Start the Party! is the sort-of sequel to the Eyetoy Play games on PS2, only now armed with a Move controller. I was a sucker for those frantic party games last gen so it’s no surprise really that I had a pretty good time with this title. 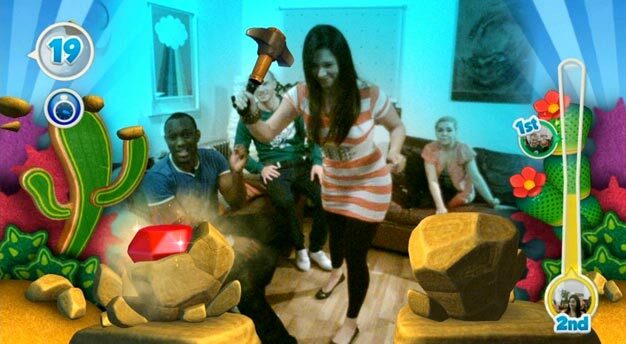 There’s a bunch of different minigames thrown into Start the Party! that transform the Move into swords, fans, paint brushes, even pizza bases. In most of the games the setting will be your room; the screen displays what the Eye camera sees, picks up the motion controller and then turns it in to the right object for the game in your very hands. You’ll then have to paint against the clock, save chicks from falling to their doom, swat bugs, mine rocks, pop balloons and a whole lot more. It’s a great way to introduce new people to the Move; seeing yourself on screen armed with a sword, slicing up fruit has a funny charm to it. The important thing is that the controls are very accessible and every game is fast-paced and over quickly, meaning you don’t take it too seriously, you just let yourself have fun for the few seconds you’ll be playing. Finesse is thrown out of the window; it’s a free for all and a fun one at that. Four people can play through a number of rounds, swapping one controller between them as they go. It’s admittedly a shame that the game doesn’t have any way for at least two players to compete at the same time, meaning most of the laughs will come from simply watching your friend fail at the simplest of tasks. Still, it is good fun to embrace the randomness of this game; it’ll keep you on your toes just with the different minigames. There are just enough game types to ensure you don’t get bored too quickly and some of the games are presented in a WarioWare-like fashion that sees the game changing every few seconds. Not all the games are a hit; fanning parachuting midgets onto a raft is a bit of a hassle and zapping ghosts with a flashlight works like a sub-sub-sub-par light-gun game, but for the most part it’s crazy and hectic enough to leave a smile on your face. There’s an option for solo-mode too if you’re looking to clean up some trophies or you actually really did buy this game when you had no one to play with. Survival mode again embraces the WarioWare approach, getting you to play against a meter that will deplete when you fail, encouraging you to last as long a possible. I’d imagine if you’re sitting down for some alone with your PS3 then Start the Party is the last game you’re going to put into the system but it’s nice to have the option at the very least. It’s all wrapped around a pretty piece of presentation too; Start the Party is a colorful game that doesn’t hit the family note so hard that it becomes annoying. Clearly it’s aimed at kids but the amusing captions will raise a few laughs from the grown-ups as well. For the most part Start the Party is pretty enjoyable and a great way to show off the Move to some of your friends that perhaps aren’t into gaming. Not all the games are fun, and I’d have liked to have seen some of them getting two players on the screen at one time, but if you’re looking for something to entertain a group of friends or family (and you don’t have any Buzz controllers), you’ve found it here.